On Nov. 15, we had a press conference and extensive meetings with Shane’s Inspiration and Landscape Structures. Since then, we’ve had a stakeholder’s matrix meeting and have shared all our thoughts and ideas around a theme of “The River” to Shane’s Inspiration’s Landscape Architect Virginia Hatley. Because the City of Lewiston is focusing on developing its riverfront, this inclusive playground theme seems like it will fit perfectly into Marcotte Park. We are now waiting for Virginia’s rendering of the design. 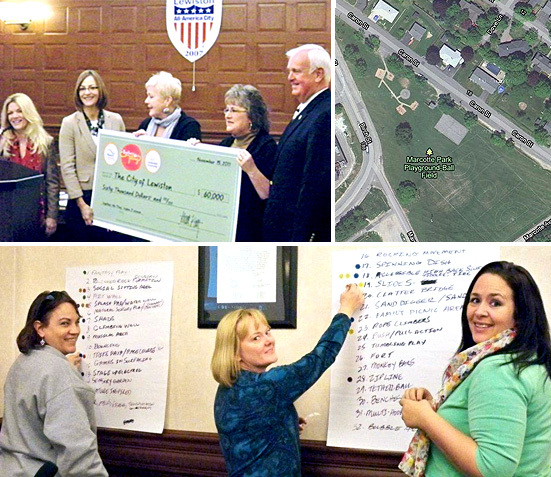 Stay tuned for more updates from the City of Lewiston, as well as the grand prize and other regional winners. This entry was posted in Inclusive playgrounds, landscape architects, Playground and tagged inclusive playgrounds, playground, Shane's Inspiration by PlayLSI. Bookmark the permalink.